How does the old saying go? Everything’s bigger in Texas, and pizza is no exception. Stop by any of the following 10 pizza joints throughout the state to discover culinary innovations, as well as slices as big as the Lone Star State yourself. Come with a Texas-sized appetite. Leave happy. Home Slice Pizza in Austin, Texas, is an “independent neighborhood pizza joint serving authentic NY-style pizza-by the pie or by the slice,” according to their website. The dine in menu is extensive, offering salads, subs, calzones, and, of, course pizza. Make your own or order one of their “Tries and True Pies,” including the margherita, white pie with spinach, or eggplant pie. The slices are huge, so make sure to follow the directions on their menu for how best to fold up and chow down. Star Pizza has been family owned since 1976 and has consistently ranked among the top pizza in Houston by The Houston Press. Now with two locations, Star Pizza offers personal and gluten-free pizzas, specialty pizzas, pizza by the slice, create-your-own, in addition to pasta and other Italian entrees. Come by for their daily lunch buffet Monday-Friday before 2 p.m.
Brooklyn’s Best Pizza and Pasta brings the flavors of New York to Arlington, Texas. The casual atmosphere is perfect for the whole family. Go for the New York-style, deep dish, or Sicilian-style pizza. Not feeling pizza tonight? Try one of their strombolis or a subs. Come see why Brooklyn’s Best Pizza and Pasta has been in business for twenty years. Pie Society has a stylish vibe going for it, as well as fantastic food. Their signature pizzas have fun, evocative names like the Illuminati (fresh mozzarella, grape tomatoes and basil) and the Eternal Flame (deli sliced Canadian bacon, fresh jalapeno, and pineapple). Feel free to build your own pie, but whatever you do, make sure to add a baked egg as a topping. Calzones, subs, and salads round out the rest of the menu. Palio’s Pizza Café boasts an authentic Italian experience at its four locations, in Denton, Grapevine, Rockwall, and Rowlett, Texas. They only use the freshest ingredients available. While the menu may differ slightly from location to location, you can always count on scrumptious pies, calzones, and special deals. Ask about the pizza of the month for something a little different, or go with one of the established options, like Grace’s Alfredo (served with alfredo sauce, roasted chicken, fresh spinach, fresh mushrooms, mozzarella, and cheddar). Rachel Ray has called Olivella’s pizza,” The most incredible pizza you’ll ever eat!” USA Today, the Dallas Morning Star, Star Telegram, and D Magazine seem to agree, having listed it among the best pizza in country. Who are we to argue, especially with pizza options like Black Truffle (house-made mozzarella, speck, mushrooms, truffle oil, and black pepper) or the Breakfast Pizza (house-made mozzarella, sauce, bacon, sausage, and eggs)? Give them a go. Big Lou’s award-winning pizza is notable for just how huge it is. USA Today College recognized it in part for its size range, which starts at 10 inches and goes all that way up to 42 inches. Get your pizza with up to five toppings, or try one of the white pizza or barbecue pizza. The 10-inch calzones are enough for several meals and the wings make you second guess the quality of every other wing you’ve ever had. Don’t forget a cannoli for dessert. 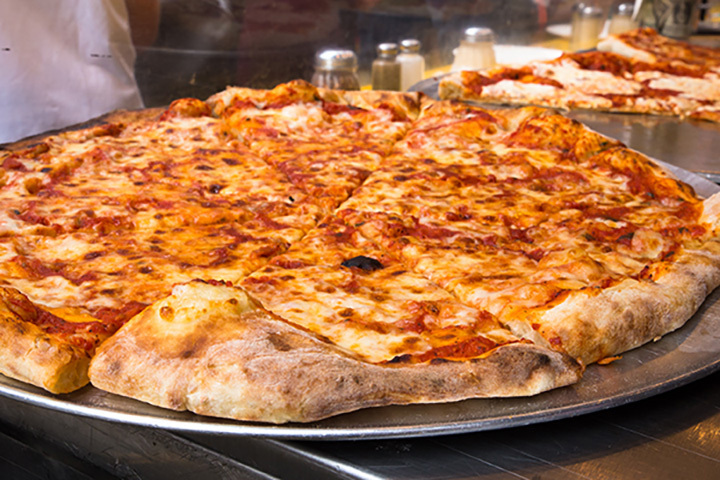 Italiano’s brings some of the best New York-style pizza to the fine folks of Temple, Texas. The extensive menu includes subs, calzones, Stromboli’s, pasta, specialty pizzas, and customized pizzas. Catering is available for any occasion, in addition to dine in, call in, and carry out options. Make sure to check their website before ordering for deals of the day. Urban Crust Wood Fired Pizza has a third-floor rooftop “ice bar” called 32 Degrees, in addition to their main pizza joint. Upstairs, you’ll find $1 off apps, house wine, draft beer, and well drinks every Monday-Friday between 4 p.m. and 7 p.m., plus live music every Wednesday, Friday, and Saturday. Monthly food specials keep the menu fresh, with new items like stuffed mushrooms and always new pizzas. The food is a little up-scale. You’ll find staples like the margherita, but you’ll also have the chance to try the Black and Blue pizza (basil pesto, wood-fired sirloin, baby portobellos, caramelized onions, bleu cheese). Tony C’s has two locations, one in Bee Caves and one in Austin, Texas. The food menu is tried-and-true Italian, with authentic recipes handed down through a generation of chefs. You’ll find your favorite appetizers like garlic knots, as well as some items you might not have tried, like bacon wrapped figs. Eleven specialty pizzas, as well as Italian dishes like homemade lasagna, subs, pasta, and salads make the menu feel full. You’ll be sure to leave fully satisfied as well.